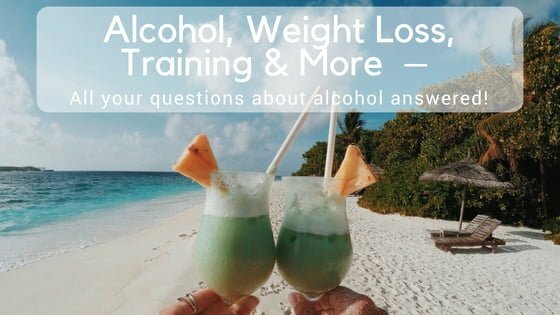 Recently you guys asked me a bunch of questions about alcohol and it’s effects on weight loss, training, gut health, bloating and more. So I’ve pulled together the most common questions and answered them for you below! Question: Can I drink and still lose weight? What drinks should I choose? Drinking can be a big factor in contributing to weight gain and failing to see results with weight loss efforts. While it is possible to lose weight and still drink, it will be much easier without alcohol or by reducing your alcohol intake. Alcohol itself is high in calories, 7 calories per gram of alcohol, which is second only to fat. The calories in alcohol are “empty calories”, meaning they have no nutritional benefit. Alcohol is often mixed with high calorie mixers like sugar syrups, softdrinks and creamy, increasing the calorie content and making it harder to lose weight. Drinking may also effect your weight because the foods that are often consumed before, during and after alcohol consumption are calorie dense. Alcohol consumption also impacts your exercise and training routine and can effect your sleeping patterns, which may cause you to feel more tired and overeat the following day. So yes you can drink alcohol and still lose weight, but it will be easier if you don’t drink or reduce your alcohol consumption. Measure your alcohol – e.g. a standard drink of red wine is 100ml. Try measuring this out with a measuring cup into your wine glass and mark where the 100ml goes up to so you are aware. Consider your choice of drink – e.g. swap high calorie drinks like pina coladas & other creamy cocktails for for lower calorie options like vodka, lime & soda water. Question: How does alcohol affect gut health and the way your body digests food? Drinking can damage the tissues in your digestive tract and prevent your intestines from digesting and absorbing nutrients effectively. This can lead to nutrient deficiencies and malnutrition. Recent research suggests alcohol can influence the gut microbiota and lead to health problems. Heavy or excessive drinking can also lead to bloating, excessive gas & diarrhoea. Drinking too much alcohol can also effect the enzymes in your pancreas and long term can lead to inflammation of the pancreas, called pancreatitis, which can have serious health complications. Question: I find I get bloated when I drink, is this normal? Carbonated drinks – many alcoholic beverages are mixed with carbonated drinks (softdrink, soda water etc). When you swallow these bubbles, the air gets trapped and builds up in your stomach, causes bloating. Intolerances – some people may have intolerances to certain chemicals in alcoholic and alcoholic beverages which can lead to bloating. Alcohol is an inflammatory substance – alcohol can cause the body to swell and this inflammation may be made much worse by the substances that are often mixed with alcohol, such as sugary, creamy carbonated liquids, which can result in gas & bloating. After a night out drinking, you may also notice bloating in your face and other areas of your body other than your stomach. This happens because alcohol dehydrates your body. When the body is dehydrated, your skin and vital organs try to hold onto as much water as possible, leading to puffiness in the face and elsewhere. Question: Why do most fitness people not drink? Will alcohol affect my training? Question: What are the health benefits of red wine? Red wine has a high concentration of antioxidants. Moderate red wine consumption has been linked to reduced risk of cardiovascular disease, however heavy red wine consumption increase your risk of cardiovascular disease. Question: What effect does alcohol have on your health? Alcohol consumption is linked to an increased risk of some cancers (such as mouth, pharynx, larynx, oesophagus, stomach, bowel, liver and breast cancer). Too much alcohol may also damage your liver and brain and increase your risk of high blood pressure and heart disease. Many Australians drink alcohol in amounts that are harmful to their health. This kind of drinking can cause death, disease and injury and is a major factor in ill health and social harm in Australia. It’s also very important to note that during pregnancy, drinking alcohol can harm the developing foetus and alcohol should not be consumed when pregnant. For these reasons, no level of drinking alcohol can be guaranteed as completely safe. 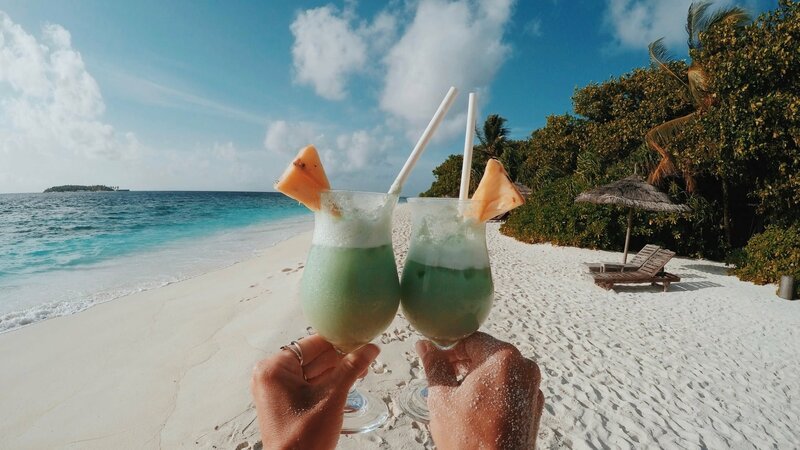 To minimise your risk of accident, disease or death, the Australian Guidelines recommend healthy adults should drink no more than 2 standard drinks on any day, and no more than 4 standard drinks on a single occasion. A standard drink is a can or stubbie of mid-strength beer, 100ml of wine, or a 30ml shot of spirits. Question: What should you do when you don’t want to drink and everyone else is? Never let any one pressure you into drinking if you don’t want to! It is your choice; not theirs. Personally I feel it’s best to make it know to your friends/family that you are choosing not to drink. And while I don’t feel that you should have to justify why you are choosing not to drink, it may help if you explain to your friends/family why you are choosing not to drink so they can understand where you are coming from. You may even find that one of your friends/family members feel the same way and don’t want to drink either. Question: Are there socially acceptable non-alcoholic drinks other than water to order at a bar? Do you have any cocktail recipes? You can opt to have non-alcoholic drinks such as mocktail, mint sodas, ginger beer, iced tea, OJ and lemonade, virgin mojitos, soda & lime etc. Click here for my favourite mocktail recipe. Question: What are the best foods to have when drinking to stop throwing up and hangovers? The best choice of food before or during night out is something that has a naturally high fat content, which will help slow down the rate at which food leaves your stomach. The longer food stays in your stomach, the slower the alcohol gets absorbed into your bloodstream. I would recommend a healthy fat option like salmon & avocado. It’s also beneficial to ensure your meal has a good carbohydrate content (think potato, sweet potato, bread, pasta, rice etc) and that you are well hydrated, as alcohol will dehydrate you. If you or someone you know needs help with drinking, click here and here for a list of contacts who can help you. Editor's Note: This is an independent article and all opinions are my own. Really good article! I just wanted to add that resent research has shown that the health benefits associated with consuming red wine have only been recorded for women above 60 years of age, and no health benefits have been found for women below the age of 60 or men at any age. Thanks Amanda! And yes, great point about the studies! !